I'm having some trouble writing the four term max function. Can you help me with that? How about a list from max[a,b] to max[a,b,c,d] ? Well, wouldn't max[a,b,c,d] be easiest to do as max[max[a,b],max[c,d]]? It should be the same. Of course, this method is basically a "squeeze function" (probably not how it's really called). By using a function max [f,g,h,...] = 1, where f,g,h are functions on some, but not all coordinates, you basically describe a shape taken by grabbing a cube and squeezing it through various lower-dimensional openings (the functions x^2, y^2, etc. are always there, but are often superseded by others and so can be omitted). In case of matrixtopes, we make the shape more symmetrical -- max[x^2 + y^2, x^2 + z^2, y^2 + z^2], for example, would have three circular cross-sections, but I don't think it's a sphere. So, thinking about this RSCCSR, I'm trying to picture how it looks in 4D. The trinity, RSC, can be loosely described as a cylinder that got squeezed sideways, through a rhombus shaped hole. There are four places where the cylinder got "shaved" , to make a trinity. The RSCCSR seems to be very duocylinder-like, with its cuts and symmetry. So, I'm wondering, what 3D shaped hole did a duocylinder get squeezed through? I'm thinking it could be an octahedron, from the two different rhombus sections. If so, the duocylinder would have gotten shaved in 8 places, four for each of its 2 distinct cylinder cuts. When a=1.57 or b=1.57, adjusting c or d, respectively, will have no effect. Only when they are equal to zero, will c and d rotate to another 3-plane. I found an implicit equation for a wire-frame cube. 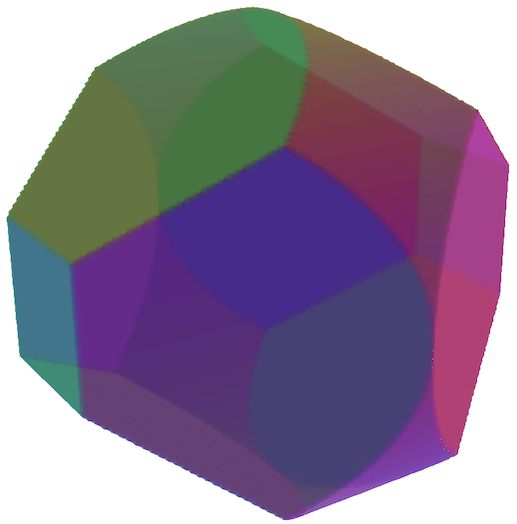 Or, more specifically, a spherated cube. 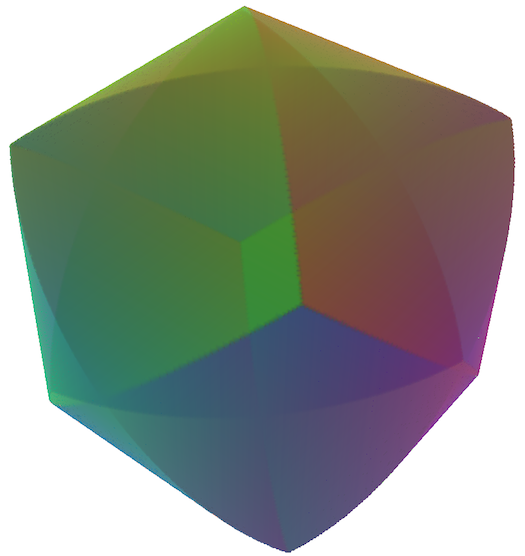 I also made glome spherating tesseract, and I'm thinking of rotating it to see if I can get wireframe tesseract slices. Produces a truss tube tesseract model in 4D. 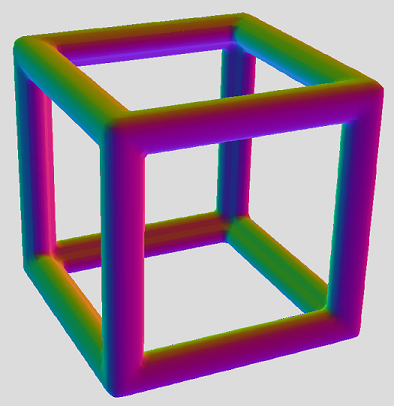 In 3D, we see ellipsoid sections tracing out the 1-frames of a tesseract. So, if defining the coordinate 2-planes will spherate the 1-frames, what about defining the coordinate 3-planes in 4D? Empties out the 3 and 4 frames of a tesseract, spherates the 2-frame with circle. Produces sections of the tesseract in the form of 3D truss tube models. This function needs an animation gallery, for sure. You can actually explore it in calcplot, in 27 cubes resolution. A bit blocky, but does the trick. Well, I've discovered a shape that I cannot mathematically define! Once you think you've got it all figured out, you find something like this. But, this equation ends up making a conic torus IO>(O) instead (cone over the circle), which is also following the correct build process! So, I'm stuck. It seems like such a simple thing, too. Both a toric pyramid and cone torus have the same derived equation, but one most certainly is not the other. Could a toric pyramid be mathematically undefinable? Does the hole of a torus present a problem, when tapering to a 0D point? Could there be something about the hole, as some kind of irreducible topological anomaly, when it comes to tapering something along a finite distance, to an infinitely tiny point? we do end up getting a torus that sort of scales to a point, but the apex and base of the supposed pyramid is a filled in disk. The hole disappears at both ends, and becomes something more like a circle over the cone IO(>O) shape. A torus exists between -0.4 < a < 0.4 . So, the equation does not accurately define a toric pyramid. Last edited by ICN5D on Tue Aug 25, 2015 1:19 am, edited 1 time in total. Have you tried an easier task to make a cone out of two concentric circles? That's basically 2D torus. But if you try to taper the whole 2 circles into a point, you have basically two options: either two cones, full and empty, with common vertex (both major and minor diameter taper), or you taper only the major diameter, leading to cone that will be full from certain point up. That's what I've been trying to do . So far, the working taper operator for shape n with m-dimensions is n> = |n + 2x_(m+1)| + n . But, this method doesn't account for the major diameter. I tried defining a tapering major diameter, but it lead to a biscuit shaped slice at the base/apex. The torinder IO(O)I equation works just fine, with an unchanging torus when sliding along the linear 4D extension. I can't seem to make a torus scale to a point, without having the hole disappear at the base/apex, or become elliptical. This is a breakdown on my procedural equation writing method, as based off my notation. An n-dimensional shape rotates around an n-1 plane, into the n+1 dimension. This n-1 plane is a bisecting plane, that divides the shape in half. The n-1 plane acts like a stationary axle for the spinning motion of the rotation. Since the stationary plane has one dimension less than the whole shape, there will always be one axis left over: the non-stationary axis. This is the only variable we change in the starting shape's equation. All we have to do is choose a stationary plane, to isolate out the one and only non-stationary axis. • If xn is already in an n-sphere parameter, it becomes an n+1 sphere, without the extra sqrt term. Bisecting rotation of an n-sphere always leads to an (n+1)-sphere. We simply add more squared variables into the existing sqrt term. The taper operator m> will extend the base-shape m along the n+1 dimension, while scaling m to a point. This is the general pyramid construction operator. It works for all non-toroidal shapes without a hole. I can't seem to define a 4D toric pyramid, the toricone IO(O)>, quite yet. I always end up with a cone torus IO>(O), instead. The taper operator acts on the minor diameter only, rather than both. c = the scaling constant, for the height of the pyramid. Since the variables in M are repeated twice, c should be set to equal out and match their numbers. Otherwise, you'll end up with tall/skinny cones and pyramids. But, this is really for cosmetic purposes, since the shape is topologically true without the constant. The extrude/extend operator mI will drag the starting shape m into the n+1 dimension. This is also the cartesian product of shape m times a line segment along x(n+1). Makes a prism out the starting shape m.
c = the scaling constant, for the height of the prism. Same rules as the taper apply. For a simple non-intersecting rotation, the same rules apply as the bisecting rotation. In terms of choosing a stationary plane, and a non-stationary axis, we use a very similar variable change, to denote an embedding into the 1D edge of a disk. A basic non-bisecting sweeping m(O) starts with shifting the starting shape m along the non-stationary axis, by the value of b. Then, we replace the variable with an equation for a circle. The cartesian product is when you multiply two solid shapes together, into one object. The simplest example is the square, as a product of two line segments. From the general product n[m] , the two shapes n and m are completely orthogonal, meaning they do not share the same variables. They are both perpendicular to each other. For the product n[m], we use all symbols for n and m. IO>[II>] is the 6D product of a cone and a square pyramid. IO>I[I>] is the 6D product of a coninder and a triangle, also equal to IO>[I>I]. 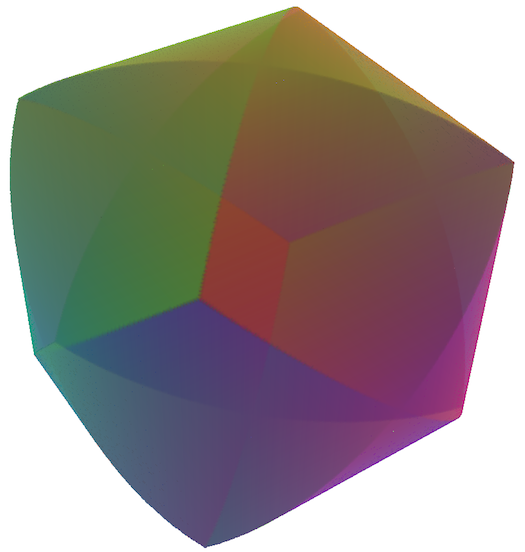 IOO[I>>] is the 6D product of a sphere and tetrahedron. The bisecting rotation of an n-prism nI, around the plane of n, is also the product of n and a circle. In other words, nIO == n[IO] . Extrude then rotate of n is equal to n x circle. The double extrude of shape n, nII, is also the product with n x square: nII == n[II] . Rather than iterate two extrude operators, it's more efficient to express as product with a square, in the actual equation. Note, however, that the product with a triangle in not equal to extrude then taper. In other words, m[I>] =/= mI> . Note the scaling constant, c=2 for the circle-zw parameter. For n[m] products, the precise value of c is more critical to express a unit-proportioned shape.